When: Tue., April 30, 12-1:30 p.m. 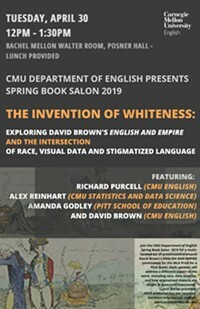 The Invention of Whiteness: Exploring David Brown's ENGLISH AND EMPIRE and the Intersection of Race, Visual Data and Stigmatized Language Featuring: Richard Purcell (CMU English); Alex Reinhart (CMU Statistics & Data Science); Amanda Godley (Pitt School of Education); and David Brown (CMU English) Lunch provided. RSVP preferred but not required. 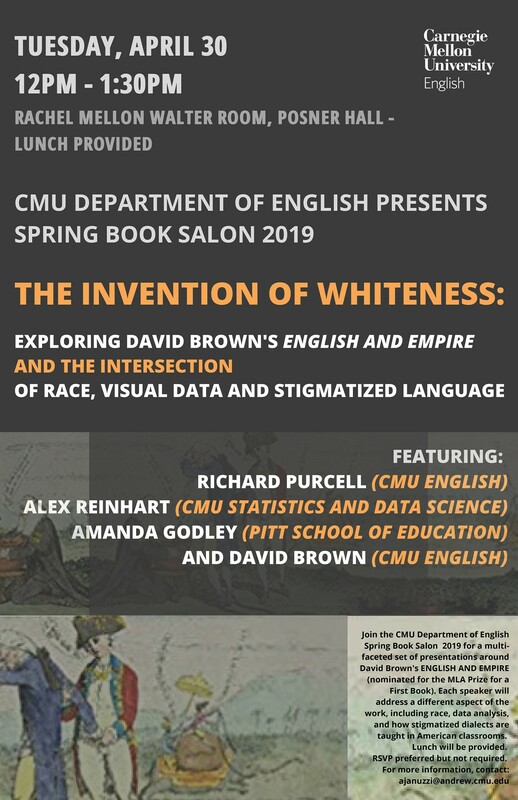 Join our Spring Book Salon 2019 for a multi-faceted set of presentations around David Brown's ENGLISH AND EMPIRE (nominated for the MLA Prize for a First Book). Each speaker will address an aspect of the work, including race, data analysis, and how stigmatized dialects are taught in American classrooms.